ACADIANA - With its moss draped trees, crawfish, crabs, shrimp, catfish and the French culture that is still trying to survive in this modern day. ACADIANA - so wonderful that Longfellow wrote beautiful words about his beloved, "EVANGELINE," under its rhapsody. ACADIANA - known for its culture and praised for its determination for recognition; truly the heart of the "Cajun Country." ACADIANA - known for its delicious food, so distinctive and yet unequalled in all parts of the world including CHINA; the forefather of cooking. "WEBSTER" defines cooking as "one who prepares food for eating; to prepare food by boiling, roasting, frying, or to concoct to suit taste." This is true in Lafayette. "THE PULSE OF THE ACADIAN COUNTRY". 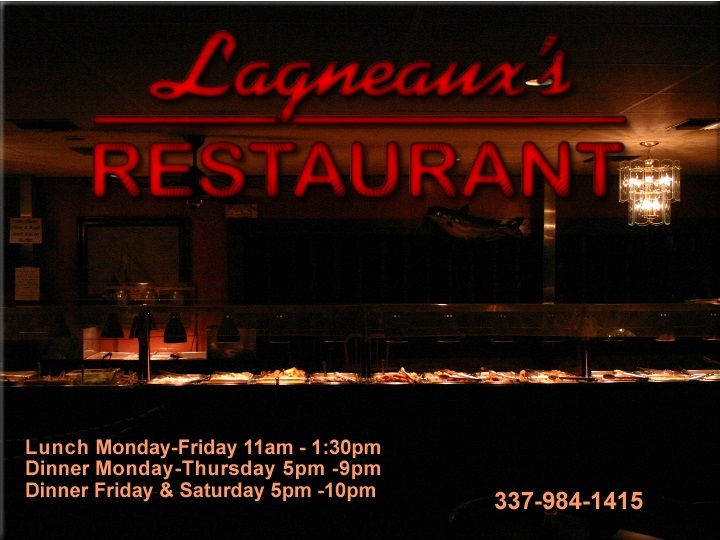 "LAGNEAUX'S" restaurant is a name synonymous with French or "Cajun" cooking, as it is often referred to. "LAGNEAUX'S" a name bred from Belgium. Is it any wonder that this food is so delicious? After all, who is more noted for cuisine than the French? Other than the Chinese? Meus Lagneaux, or Junior, as he was affectionately known by friends, rightfully earned the title of the "Seafood King," and his children and grandchildren continue the tradition for over 40 years. As you sample his recipes I think that you too will agree, that none can compare, from Houston to New Orleans. Try King "LAGNEAUX'S" seafood platter. "The Specialty of the House," Packaged daily to insure freshness under careful supervision, and I think you will agree, "They're the busiest because they're the best." LAGNEAUX'S is the true family restaurant. Children are always invited and welcome, and Dad doesn't even have to wear a tie, Mom and Sis can wear shorts, and the children can come as they are. Isn't that comfort? No matter where you're from, you may not remember how to pronounce the name, but you'll never forget the taste. No brag folks, just facts. Who can cook better that a "Cajun" with ancestors from Belgium... We at LAGNEAUX'S hope that you enjoyed your meal, pass the word along, please do come back be all means, because without you we could not speak of any success.